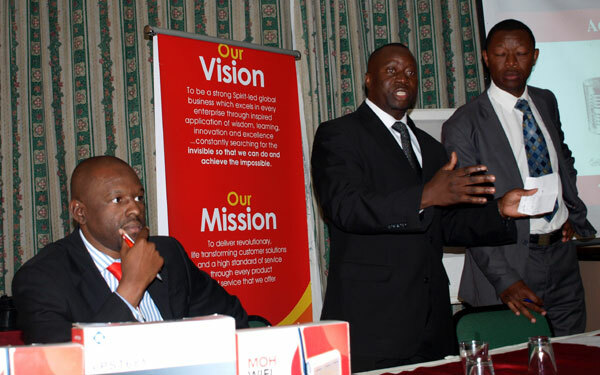 Speaking at a Computer Society of Zimbabwe function yesterday, Spiritage Communications Managing Director Mr. Kangai Maukazuva disclosed the company has deployed a 3.9G network. Maukazuva was presenting the topic “Communication technologies for the future” to a huge group of information technology professionals. The presentation centered on the evolution in telecommunications to next generation networks (NGNs). According to the Spiritage executives at the function, the company has deployed a TD-SCDMA network. TD-SCDMA is a 3G standard technology whose development has mainly been pushed by the Chinese government as an alternative to 3G technologies developed by Western countries. 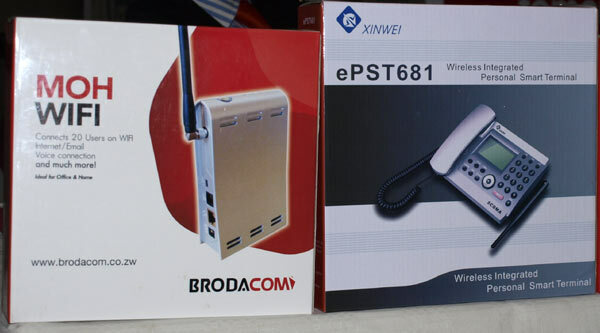 Spiritage is sourcing its network equipment from Chinese suppliers of the technology. The function last night was also attended by Spiritage Group CEO Mr. Zachary Wazara as well as Mr. Parkvoo Mutendera, the group Chief Commercial Officer. Spiritage, as you may know, launched voice and data services last month. The company is currently pushing three devices that were on display last night; an indoor Internet access device (that connects to the Spiritage network wirelessly and can provide Wi-Fi to 20 concurrent users), a desk phone (that can do SMS, voice, and internet) and a push-to-talk device (that can be used as an internet modem, provides SMS and conventional voice). The packaging boxes of two of those devices are in the picture below. The price of the Wi-Fi device is about $250. For home users we imagine this is a good deal. If you’re trying to avoid the high fixed WiMax equipment cost and TelOne is telling you they have no more ADSL capacity, you should find out more about the product. The price of the service per megabyte is quite attractive too at US $0.068. Though these devices are available right now, there’s literally no information about the products on the internet, the one place you’d expect an internet company to be heavily present. It’s therefore very hard to get information save for calling Spiritage or physically visiting their offices, if you’re lucky enough to know where they are. The Brodacom website shown on the boxes (www.brodacom.co.zw) loads some default Apache page which no one bothered to replace with the company’s proper branding. And as for the website that Spiritage briefly brought online last month (www.brodacom.com) there’s still the unbranded “website coming soon!” sign. The current spin on the lack of internet presence from Mutendera is that Spiritage deliberately don’t want to have any presence on the internet right now. He says that, even though the company has product boxes with a web address on them, so we don’t understand (read believe) this at all. While Spiritage has launched voice services, interconnection has only been made with the Econet network right now. In summary, subscribers buying the Brodacom voice service right now cannot call Telecel, NetOne, TelOne and Africom numbers. Africom, an IAP that launched voice services almost 3 months ago, has also had major delays interconnecting with mobile operators. Africom has live interconnection with Telecel only at the moment. The Spiritage executives explained that interconnection was not a problem at all and that the process is just procedurally a long one. Again, we didn’t find this completely understandable but if the IAPs themselves are not complaining, why should we? And as for 3.9G, a company tagging the generation of its network is more a marketing effort than an actual on-the-ground performance measurement. In fact the marketing speak of 3G, 4G and so forth is downright abused world over and in our opinion should not drive any decisions on adopting a service. True, the 3G or yada-yadaG should not drive purchase decisions. Bought a fone with 10.2MBPS but only realise a 460kbps max or less. grrrrrr! Econet @work is $ 0.04 per MB on the largest bundle ? At times silence is a sign of people who are not sure or confident about what they are doing , but yet I prefer people like that, they get the benefit of the doubt. at least Spiritage is doing something.I like their branding. You dont understand Kurai, The war btwn the GSM and CDMA camp is over. The true 4G standard,LTE will be backward compatible with both UMTS and CDMA2000. So these guys are looking into the future and also its not easy to get the GSM frequency bands in ZIM. ‘The price per Meg is quite attractive at 0.068’ Is it attractive, just comparable to the others or am I missing something? Price per Megabyte to high…… better to stick with what you are using…dont have to buy a new dongle and got more reliable coverage. We need some who shifts the game…. the cost is reasonable compared to…..surely its reasonable.But guys you hv got to interconnect with telecel and netone as fast as possible. Zach was there-so we missed out big time hey. Zimbabwe telecoms space is interasting. There are too many marketing, management, HR and accounting guys who are leading these companies. Most of the successful tech companies in this world are lead by people with a lot of organic experience in technology (steve jobs, bill gates, dabengwa (mtn), etc). I hope they can bring about organic innovation to help utilise the data networks they have invested in. The new technology space is now very interesting because large companies are competing with teenagers in their parents garages in monetising online services. Lets see how they achieve ROI investment with a decrease in the data costs and competion. Technology is just an enabler! WTF is 3.9G?? It doesn’t even mean anything! When did Generations become continuous rather than discrete? ‘2.5G’ was a misnomer; but it was supposed to be halfway between 2G & 3G…what is this madness? What’s next – 3.97G? Sometimes I loathe marketing-speak. its all a load of crap!,to be honest!…I don’t care whether it’s 3G,4g or 10G,or that we expect is something reliably functional..stop confusing us with unnecessary jargon,you IT cos….just deliver a good product and it will speak for self,ok?…right now,Econet has talked about 3G,blah blah,what 3G?..its only in Hre and major cities..the rest is ineffective EDGE system…I am dissapointed with Zim Tech companies…all noise but NO or poor delivery,same goes for Africom…a bunch of confusionists!…i rest my case! Guys, lets be honest, its a lot of capex to deploy 3G all over the country. I think Econet has done a great good deal in deploying 3G in major cities and Edge all over. Its an evolution. Kudhara there was dialup…saka why cry about EDGE ichikupa 100Kbps. on. They make more noise than the people who invented the technology. i am personally happy with the development happening in zim in ict sector.come on guys do the best you can and give us service.we are tired of monopoly.come on do it we are behind you. the wifi is unique.infact all your services guys are unigue for sure.we had a test of them at the agricultural show and it was xmwiii.well done.just dont follow the tarriffs existing.i like the plug and go.Plug and GO! guys we need our numbers so that we can start calling out big time at only 10cents not zve 23 cents marara ayo.hapana zviripo apa.dont worry guys siyanai ne avo varikuvhunduka.hahahahahaha.tipei service ti sarudze tega. Spiritage yauya nazvo wena.guys how far with chegutu coverage? BRODACOM- guys you must give us the service.we are ready for the service.some of us we are in vic falls and we need the service.we are tired of fek service. thanks Kabweza.You are making the industry getting more and more interesting.I like the way you aticulate things.fair play thats it.usatenwe zvako iwe.big up.Spiritage/Brodacom big up. Posting some 8 comments using different names each time is just wrong. Yes, we can tell. Please just stop. I am glad that BrodaCom has upped the stakes in the Telecoms sector. The tariffs are extremely reasonable and the speeds are good! !The branding is off the chain, but I’m not too sure whether people know about ur products, more advertising please. Aika why are people getting irate over other people’s developments (good or bad). Good to have a variety and choices. Let broadacom alone if it does not appeal to you. Good going with the reserved number by the way. means i can maintain my current number and change the head when i cross over.